Our guide to the movies debuting on the streaming service this year. Netflix has become a major Hollywood player thanks to their original movies, and 2017 sees more films produced under the banner of the streaming giant than ever before. In the first of two Netflix originals featuring Robert Redford, the veteran star plays a physicist who proves scientifically that there is indeed an afterlife, a revelation that leads to mass suicides. When his estranged son (Jason Segel) attempts to convince him to discontinue his dangerous research, he finds his father is on the verge of an even deadlier scientific discovery. Rooney Mara also stars. Angelina Jolie's fourth directorial outing is based on the memoir of Loung Ung, which details the author's life as a child surviving Cambodia's tyrannical Pol Pot regime. Filmed on location in the Asian nation, the movie features a local cast with Jolie remaining behind the camera for this one. The Guest and You're Next director Adam Wingard helms this live action remake of the cult Japanese animated series. When a young man discovers a notebook with the power to cause the death of anyone whose name is written in its pages, he uses it to dispatch those he believes the world would be better off without. After the misfire of 2016's Blair Witch, hopefully this will see Wingard return to his previously impressive form. With Earth having suffered an environmental catastrophe that will soon leave it uninhabitable, a teenage girl (Margaret Qualley) attempts to find a way of saving the planet before the final starship leaves for a new colony. Anthony Mackie and Danny Huston co-star. The rise and fall of American comic institution National Lampoon is documented in this drama from Wet Hot American Summer director David Wain. The story focusses on comedy writers Doug Kenney (Will Forte) and Henry Beard (Domhnall Gleeson), with a supporting cast portraying such comic icons as Chevy Chase, John Belushi and Bill Murray. Two friends attempt to make their way across country to a hip-hop concert in California. TV screenwriter Chester Tam makes his directorial debut with this comedy. Actor Macon Blair, best known for his collaborations with director Jeremy Saulnier (Blue Ruin, Green Room) makes his debut as writer-director with this crime drama. Melanie Lynskey plays a burglary victim who, along with her neighbour (Elijah Wood), attempts to track down the criminals responsible. The movie will debut at Sundance before hitting Netflix in February. 50 years after appearing together in Barefoot in the Park, Robert Redford and Jane Fonda reunite for this adaptation of Kent Haruf's novel. The two play widowed neighbours who finally form a bond after having lived near each other for decades. Ritesh Batra, who gave us the breakout Indian drama The Lunchbox, directs, while Bruce Dern, Judy Greer and Matthias Shoenarts also star. 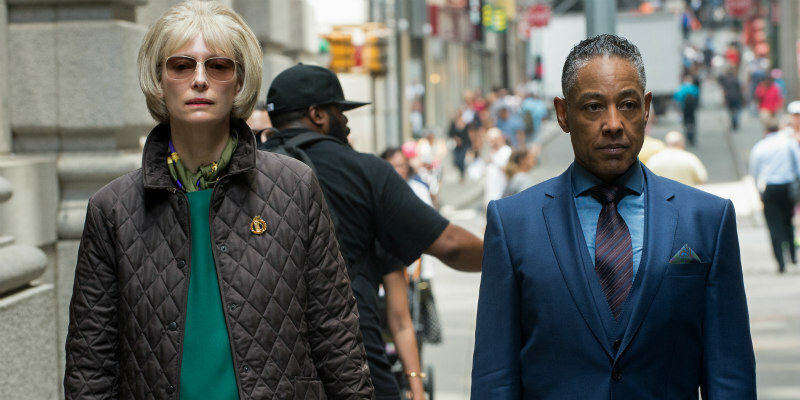 In terms of the talent involved, Okja is Netflix's biggest production to date. Korean auteur Bong Joon-ho (Snowpiercer) directs a script from Jon Ronson (Frank) about a young girl's attempts to protect Okja, a creature wanted by a shady multi-national company. Newcomer Ahn Seo-hyun leads an impressive cast that includes Tilda Swinton, Lily Collins and Jake Gyllenhaal. A quartet of teens attempt to break into the US Mint in order to acquire the cash needed to save their high school. Coin Heist is the latest from writer-director Emily Hagins, who wrote and directed the horror movie Pathogen at the age of 13(!!!). Having provided a new home for Adam Sandler, Netflix now gives refuge to Marlon Wayans, who stars as a man who relives his wedding day in a Groundhog Day style loop, waking naked in an elevator every morning. From the director of A Haunted House and Fifty Shades of Black, which should tell you what to expect. Edgar Wright's Baby Driver isn't the only movie featuring a getaway driver coming our way in 2017. Frank Grillo is the eponymous speedster in this thriller. When a bank robbery goes pear-shaped, Grillo finds his loved ones' lives on the line and must use his driving skills to win a race against time to save them. Psychiatrist Vinessa Shaw attempts to put her life back together following a violent assault, but a new patient forces her to relive her past. William Atherton co-stars, and we bet he ain't the romantic lead. In Netflix's first UK movie production, a teenager is shot while attempting to prevent an attack on the girl he loves. When he wakes from a coma he discovers fragments of his phone embedded in his head have given him super powers. Maisie Williams, Rory Kinnear, Miranda Richardson and Bill Milner star. Arguably the tastiest of Netflix's coming treats sees writer-director David Michod (The Rover) take on the story of US general Stanley A McChrystal (Brad Pitt), the larger than life figure who led the US military campaign in Afghanistan. Pitt is backed by a stellar cast featuring Tilda Swinton, Ben Kingsley and Emory Cohen. Expect Netflix to push this one for awards consideration with a qualifying theatrical release. The controversial practice of 'hazing' at US colleges is explored in two movies due this year - Andrew Neel's Goat and this Netflix original from director Gerard McMurray. Both movies follow a student torn between fitting in and standing up against bullying at an educational institution. This one features an African-American cast top-lined by Trevante Rhodes, Alfre Woodard and singer Serayah. A cult Japanese comic book gets the Netflix original treatment. "In a distant dystopian future that is wild and out of control, join Killy on a quest to reclaim a dwindling civilisation from the brink of oblivion," reads the official synopsis.